While I can't really say it's a lifelong dream of mine to drive a cab in New York, there is a certain appeal to, at least temporarily, joining the worlds largest, slowest fleet of professional drivers of yellow cars in the world. I was given this chance to realize that childhood not-dream by Nissan, so I could try their new taxi. 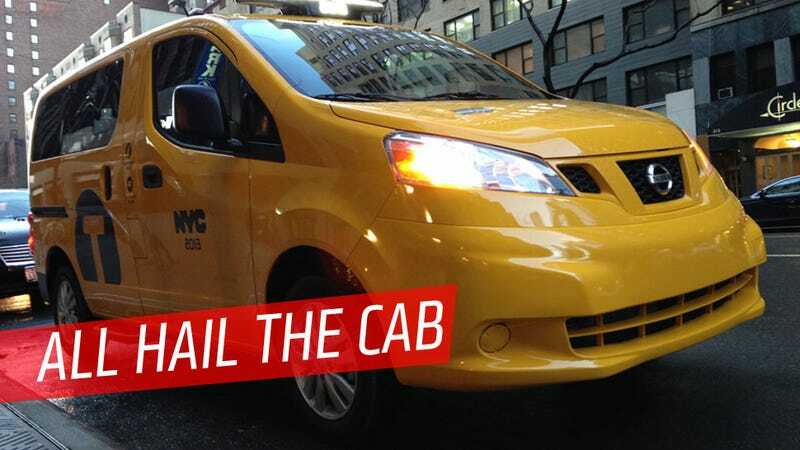 I've driven the vehicle their new cab is based on — the NV200 — before, and in general I liked it. It's not the most exciting vehicle in the world, but it does its job quite well. I'm also the only one out of the entire Jalopnik staff that doesn't think it's horrible looking, so you may want to keep that in mind as you read this. The truth is the NV200 actually makes a really great cab. As much as it hurts to say, it makes a much better cab than the old Crown Vics that used to ply the city's streets. Sure, the Crown Vic is more fun to drive, with its big V8, rear drive, and willingness to drift through alleyways full of cardboard boxes, but when it comes to access, passenger accommodation, economy, maneuverability, a van-like cab design really has it beat. It's clear Nissan's put a good deal of thought into the cab. Sliding doors mean much less smacking swing-out doors into joggers, cyclists, and the occasional CHUD, the floor is totally flat, there's a vast amount of headroom, and plenty of cargo room behind the seat. They even have side-curtain airbags designed to not interfere with the cab's internal divider, which, surprisingly, is a first in this segment. There's nice amenities like USB charging jacks and a full-length glass roof, which really does make cab rides more enjoyable. They even are using a charcoal-based headliner to, as I was told "help keep the cab from smelling like vomit." And it seems to work! Unlike most press cars that have been through innumerable journalists' hands, this one hardly smelled like vomit at all. There's also an intercom system for the rear passengers to talk to the driver, and it works just fine, though it also has a hidden feature for the driver. Since the passengers, safe behind their plexiglass divider, have a little switch to turn on and off to talk to the driver, it lulls them into thinking that they can't be heard when the switch is off. That's not exactly true. Sure, it's easier to hear them via the intercom, but you can easily make out speech with it off from the driver's seat. This lets the driver determine if the passengers are, say, racist assholes when they think the intercom is off, and then the driver can adjust his performance accordingly. So, from a passenger's perspective, it works well. But I was there to find out what it's like for a driver. The short-hood van-style design puts the driver up high and quite close to the front of the taxi. This is very good, since the vast acreage of yellow hood that old Crown Vics offered up for viewing out the windshield wasn't ideal for the sort of close-quarter maneuvering that busy New York traffic often requires. The driver's seat is comfortable, and I was assured would be compatible with a beaded seatcover, as TaxiGod intended. The controls are simple and clear, though I have no idea what this switch with the exclamation point does — turns shouting on and off? Initiates the Nissan Surprise Emitter System? I conducted my test with an actual, real passenger — or at least as real as ex-Jalopnik editor Ray Wert. Ray needed to be taken to some big glass building on 57th street now, as in pronto, as in yesterday, dammit. Ray clambered in the back, determined to test out the vomit-tolerance of the cab. I lurched out into heavy New York traffic, streets still glistening with semi-melted snow. This should be a good test. The NV200 platform is easy to drive, and the CVT transmission, while still sounding and feeling not quite right, does do an admirable job of the repeated starting and stopping, and full throttle starts and rapid lift sort of driving that the lurching traffic patterns force you into. Weaving around trucks that seem to randomly stop to disgorge people and cargo is a big part of New York driving, and the Taxi of Tomorrow (that name) proved to be quite nimble, even on the wet pavement. The short overhangs were helpful here, as often the amount of room you have to turn around a suddenly stopped car or truck is pretty minimal. The big Achilles' heel of the Taxi is pretty significant one, though: the rearward vision. That nice big plexiglass divider is concave when viewed from the drivers' seat, and it does do some distorting when you look through it via the rear-view mirror. On top of that, the NV200's rear view isn't the best to begin with, having a pretty thick divide between the uneven twin windows on the back doors. Not being able to see behind you all that well is a pretty big handicap for a NYC cab, since so much of driving in Manhattan involves jockeying for position in traffic. I think there could be an easy solution, though: let the rear view camera stay on all the time. I suspect there may be some sort of rules against that, and if you have the nav system on it may prove annoying, but overall a constant camera feed of what's right behind you seems pretty useful to me. Overall, I think the NV200 platform does what it always does: a good, honest job. Not the prettiest job out there — though I do think the black/yellow color scheme works better on the NV200 than when they try and pretty it up with that awkward chrome grille. New Yorkers are certainly happy to accept it as a cab, too. I had to tell several people that I wasn't really a cab (despite my hopes to make a few bucks, we were forbidden to actually pick up fares), and one woman gave me the most suspicious, critical look you could imagine as I tried to talk her out of opening the door and getting in. She could tell I had to be working some racket, but she wasn't quite sure what it was. It's the auto-journalism racket, baby! The best racket there is. In the end, I managed to get Mr.Wert to his appointment on time, but he still stiffed me for the fare and the only tip I got were the ones on the ends of his fingertips as he slapped me. Still, always an honor to drive Ray Wert, right?